Can I Install Radiant Barrier When I Have a New Roof Installed? 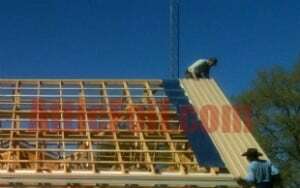 It depends, if you are installing typical asphalt shingles and want to add radiant barrier under the shingles without an airspace then the answer is NO. If you are installing any type of roof that has an air space (either built in by the shape of the tiles or because of a batten system), then you should most definitely install a radiant barrier! These types of roofs are usually clay tile or slate roofs, metal shingle roofs & some standing seam metal roofs. If you are using a batten system (wood nailers on top of the deck), then you will automatically have the required airspace for a radiant barrier to work properly. Your roofing company should be able to easily install RoofingFoil™ Radiant Barrier under your new roof. All they have to do is add one additional layer on top of the waterproofing layer (below the battens). Just a few staples or plastic caps will hold the foil in place until the battens are installed over it. For most roofing applications, you should use a perforated (not a vapor barrier), so it will allow moisture to dry out and not get trapped in the roofing assembly. 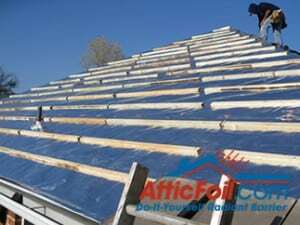 Installing the radiant barrier foil under a metal roof is quick and easy. Installers just roll it out and cut it with a knife. Use a few staples to hold in place, then install battens. Generally a 1/2″ air space or more is ideal between the radiant barrier and the shingle or tile roof. By installing RoofingFoil™ radiant barrier under the battens, 97% of the the radiant heat that would have been absorbed by the roof deck is now reflected. Considering the expense of metal roofs, it is a small additional cost to install radiant barrier during the roofing installation. When you stand inside this attic, it is hard to tell whether the sun is shining or not. Since so much of the heat is reflected before it enters the attic, it feels like a cloudy day. Economical, effective and energy efficient!